Stevia is a tropical plant bearing leaves that are very sweet. Growing primarily in Paraguay and Brazil, stevia is a wild herb in the chrysanthemum family. 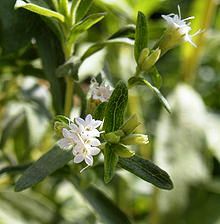 Stevia has been used in South America for hundreds of years as a natural sweetener. WHY USE STEVIA INSTEAD OF SUCROSE? There are no calories in stevia, and yet, it is much sweeter than sucrose (white sugar). Stevia doesn’t raise blood sugar. It provides an alternative to people on low carbohydrate diets, diabetics, and as a weight-loss aide. Current research indicates that stevia does not harm teeth. If you’re a diabetic, and are in doubt about using stevia, check with your health-care practitioner. If your doctor is unfamiliar with stevia, do your own research, and bring it to their attention. 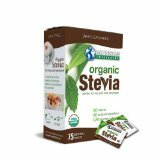 HOW DO I USE STEVIA? Stevia is used just like sucrose (white sugar). Since it’s sweeter than white sugar, you’ll need to adjust your recipe, and use less. Go to stevia.com for recipes about breakfast foods, beverages, breads and muffins, desserts, jams and jellies, salads and soups. Stevia is sold in powder, liquid, or handy packets. Whole Foods Markets, and most health food stores sell stevia Here are some online stevia shopping websites: Stevia.com, HealthyShoppingNetwork.com, and Amazon.com. Posted on February 21, 2013, in Food and tagged healthy eating, low-carb diet, stevia, sugar substitute, sugar-free. Bookmark the permalink. Leave a comment.